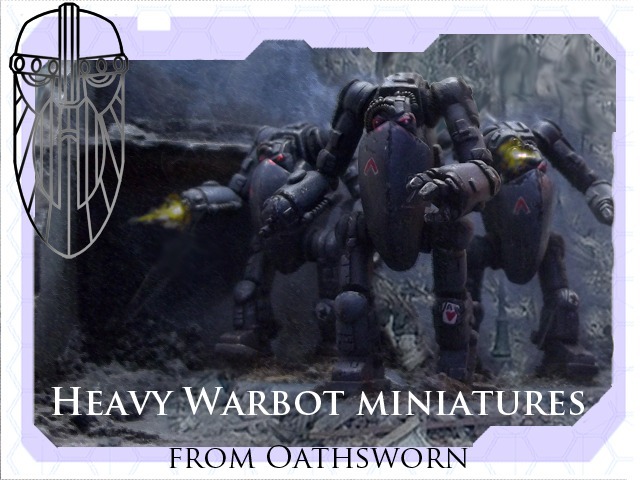 Oathsworn Miniatures has launched a Kickstarter campaign in order to fund some new sci-fi robot minis. Go check them out for yourself. This is something a bit different for us - we've only done fantasy miniatures projects on Kickstarter up to now. But when we first started making miniatures, we began with robots for sci-fi wargaming; but we didn't do much with them. And people keep asking us when we'll be releasing them. But we need to have production moulds made first... which is where this Kickstarter project comes in! We are raising the funds needed to have the moulds produced, and to buy in a batch of pewter for casting. Our funding goal of £800 will cover that. You can pledge for one warbot, 3 warbots, or even 6... or if you just want to be involved in a small way, there's a £1 pledge level too. Below you'll see pics of the Pledge levels, a scale picture to show the size, and some possible Stretch goals.